Singapore – noisycrayons, has launched a consumer engagement campaign on social media for Maybank Singapore. 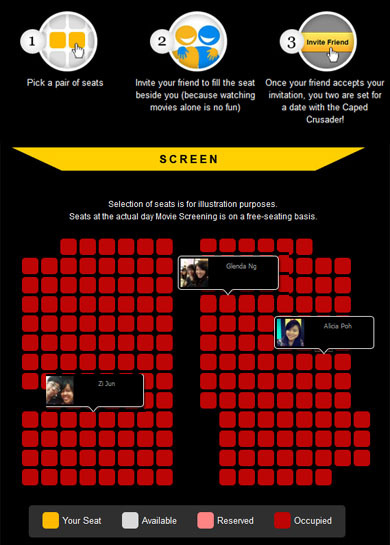 The Maybank eVibes Movie Giveaway rallies 200 Singaporean students between 18 to 25 years of age to invite a friend to watch a movie together. The campaign is also designed to provide compelling reasons for students to recommend the giveaway to their friends, and by extension, increase their awareness of Maybank’s eVibes card and the specially tailored benefits the cards brings to student Cardmembers. Upon landing on the campaign’s minister, a visitor is prompted to pick two seats in the virtual cinema displayed on their screen, followed by connecting their Facebook account to the campaign so that they can invite a friend to fill the second seat. The invitee has an hour to accept the invitation. If the invitation is accepted, the inviter will receive two tickets to a screening of the Dark Knight Rises, the conclusion of Christopher Nolan’s much-acclaimed Batman trilogy. The campaign is expected to reach socially inclined youths, who always have their thumbs firmly on pulse of the latest trend and interested in enjoying the finer things in life, on social media and increase their awareness and interest in the Maybank eVibes Card. The Maybank eVibes Card is a credit card designed for youths and students 18 years of age and above. Keeping the limited budgets of student Cardmembers in mind, the card has no income requirement and a $500 credit limit. On top of that, Maybank has also thoughtfully teamed up with merchants well-liked by the young and happening crowd to provide 1-for-1 and 1+1 deals catering to the discerning tastes of eVibes Cardmembers. The Maybank Singapore eVibes digital engagement campaign is managed by noisycrayons, a digital creative agency and an affiliate of SPH Magazines.